It is now June, the first month of meteorological summer, but it seems winter is only just coming to a close on the Great Lakes. 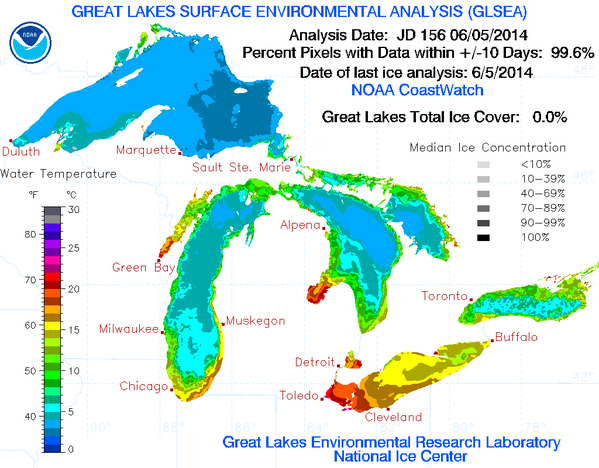 For the first time since November, according to NOAA, the Great Lakes are ice-free. This marks the latest total thaw on the lakes since record keeping began in the 1970s. Back in March, during one of the coldest winters the region has seen in decades, more than 92% of the Great Lakes were covered by ice. That was the second highest percentage on record. While a recent string of warm days in the area helped to melt the lingering ice, the U.S. Coast Guard also played a key role. They have reported conducting over 2000 hours of ice-breaking operations throughout this past winter and spring. Only recently thawed, water temperatures in the lakes are expected to remain rather chilly for most of the summer. This entry was posted in weather and tagged ice, national, record, winter by Melissa Fleming. Bookmark the permalink.